I’m told by my female friends that Jack and Irwin are attractive guys, so looks are not the primary issue in finding a significant other. Plus, both hold steady, well-paying, respectable jobs. Oh, and neither live with their parents. So why are they still single? Well, for Irwin it’s simple. He’s single because he’s not aggressive enough. He’s the type of guy who will go out on a Saturday night, hang out with the guys, and if no girl makes the first move, then he’s going home alone that night. In other words, he doesn’t promote himself. Jack is the opposite of Irwin when it comes to promoting himself. In fact, Jack rarely goes home alone at night. That’s not the problem at all. The problem with Jack is he doesn’t ever build lasting relationships. So he’ll date plenty of girls, but none of them end up working out. In my experience, I’ve found that most small businesses act more like my friend Jack than Irwin. That means, you probably invest heavily in promoting your business, but you’re failing to build lasting relationships with your prospects and customers. Am I right? Are you putting as much effort into building strong relationships as running promotions? If you’re not, then you’ll end up a serial dater like Jack, churning through new prospects and customers, month after month. To be successful, your marketing must include both promotional and relationship-building elements. So let’s take a look at what this means in practice. 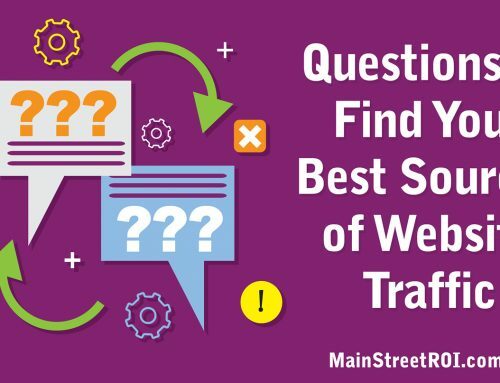 There’s a disproportionate amount of information available about driving website traffic, converting traffic, and running promotions versus starting and building relationships with your prospects and customers. And I believe that is one of the main reasons why so many small business marketing campaigns fail: Not enough time and energy is devoted to using online marketing tools to build relationships. So I’ll give you 3 tools to get you started. Email marketing is my absolute favorite tool to start and strengthen relationships with our prospects and customers. If you already receive the Main Street Marketing Tips newsletter, then you know how much we invest in email marketing each week. Yes, we do promote and drive sales via email, but the vast majority of our email marketing is relationship-building. If it wasn’t, then our subscribers would eventually tune us out and our sales would plummet. If you’re not currently using email marketing, then this is a huge hole in your online marketing. Many prospects are not ready to make a purchase when they first visit your website, but they would be happy to give you their email address. This is like getting a phone number when you first meet someone. It’s not a date yet, but you now have contact info to follow up. The second tool to build relationships is content marketing. Think of content marketing like a bunch of friends who are always talking you up to anyone attractive they meet. 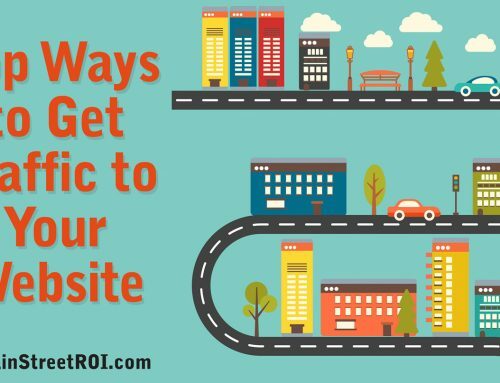 Articles, videos, webinars, and podcasts are examples of content you can create that will form a positive first impression with any new prospect. With this in mind, be careful about outsourcing content creation. Everything you publish, including articles for search engine optimization (SEO), can and will impact your relationship with prospects and customers. So, make sure everything published in your name is up to your standards. The final tool I’ll discuss is social media. Too many businesses try (and fail) to use social media as a promotional tool, rather than the relationship-building tool that it’s designed for. Social media websites are places to be social. Think of it like going to a bar on Saturday night. You wouldn’t scream out to everyone that you’re single looking for a date, right? Obviously not. Social media requires a big investment in relationship marketing combined with the occasional, tasteful and timely promotion. Of those three tools, I recommend every small business get started with email marketing first. Then, once you have your system to email new prospects, nurture old prospects, and strengthen your bond with customers, then move on to one of the other tools above. Great article. The one thing I would add is to measure the impact of your marketing to determine where you are getting the greatest return. Most small businesses have limited time and dollars and need to monitor where they are getting the greatest return for the time and money spent. That’s a great point. As our name suggests, we’re all about tracking and closely monitoring return on investment (ROI). With that said, the relationship side of marketing is much harder to track than a promotion, and it requires a longer time-frame to measure. For example, you can’t expect an immediate return from sending an email that strengthens your relationship (with stories, information, tips, tools, etc.). But over time these activities do snowball and it becomes more clear which tactics are more engaging and driving sales. The other reason why small business marketing fails is because the entrepreneur and their staff dont know how to sell and often dont like selling. Telling is not the way to market nor sell. THats why many small businesses fail. Good points. Thanks for sharing Neil! I work as Personal Assistant to two clients who are struggling with their small businesses. It is clear to me why they’re struggling as they have no budget plan at all. One spent almost 50% of his money in the bank just for marketing and the other doesn’t want to pay for any marketing expenses *sigh. I learned from their mistakes :) & I don’t have to spend my money to get the experience :) someday I will have my own small business. That’s great to hear you get to learn from your clients and see how to avoid some of their mistakes. Good luck starting your business!